PLAYERS and management from Premier League team AFC Bournemouth have officially opened Westover Group’s new £15 million Jaguar Land Rover showroom in Dorset. Cherries team captain Simon Francis, David Brooks and Ryan Fraser together with manager Eddie Howe, assistant manager Jason Tindall and assistant first team coach and club ambassador Steve Fletcher visited the purpose-built showroom in Christchurch to cut the ribbon to mark the opening, have a tour and meet some of the 100-strong team. The dual-branded dealership accommodates more than 100 approved used cars as well as a complete line-up of new vehicles in a light and spacious environment. Other facilities include a complimentary barista bar, electric vehicle charging points, customer seating areas with free wifi, interactive colour and trim display, brand heritage and merchandise area, as well as dedicated areas for vehicle handovers plus improved easy-access parking. 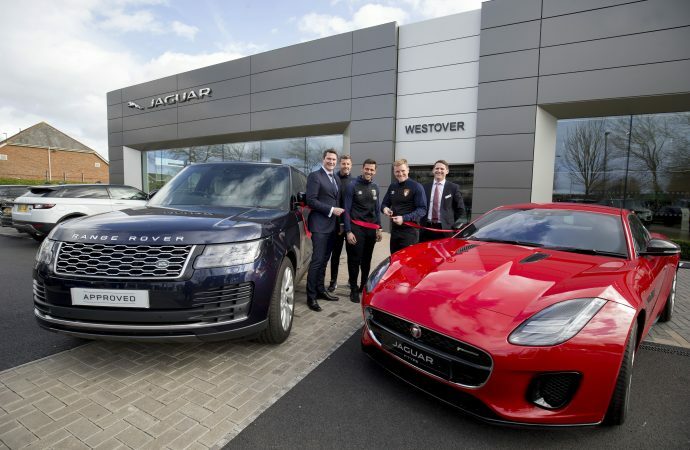 Andy Grant, brand director for Westover Jaguar Land Rover, said: ‘We were delighted to welcome some of AFC Bournemouth’s players to the showroom and thank them for marking this significant opening with a ribbon cutting. Established in 1923, the Westover Group operates from 28 locations across Dorset and Wiltshire and represents 15 vehicle manufacturers.